It's been on my wall for years. It was the fall of 1994, and my friend Mark and I were comparing Heisman trophy contenders. Yes, I know, I lived in Maine, I should have given two craps about college football, yet for some reason here we were, going over players. "Rashaan Salaam or Kordell Stewart," I said. "Colorado is every one's bandwagon team." "Nope," said Mark. "Steve McNair, Alcorn St."
"Mark, he plays for a school no one ever sees," I said. "Kerry Collins, Jay Barker?" "No", Mark replied adamantly. "Steve McNair is the best player in the nation right now." McNair proved him right, gaining nearly 6,000 yards rushing and passing. He had 53 touchdowns, surpassed more than a dozen records and was named an All-American on his way to winning the Walter Payton Award as the top I-AA player. He finished third in the Heisman Trophy voting behind Rashaan Salaam and Ki-Jana Carter. "Mark," I said after the Heisman announcement. "McNair was robbed." 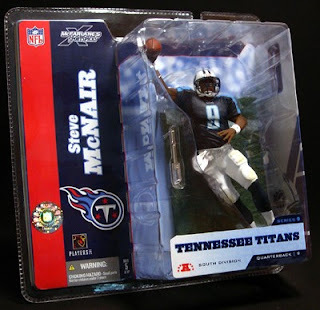 So began a fandom of Steve McNair, someone I never had the pleasure of meeting, even though we shared the same area for 3 years in the late 90's. When I was stationed in Ft Campbell, Kentucky in 1997, I remember driving into Nashville, and I decided I had to drive through it while listening to Snoop Dogg, as going in listening to country would just be corny. One of the first sites I saw on a November night was a structure now known as "The Coliseum", which in two seasons was to be the home of the Oilers (they changed their name to "Titans" in 1999). It didn't hit me at the time how many football memories were about to happen in that place. I didn't know that just a few miles away, 12 years later, the man responsible for many of those memories, Steve McNair, would be gunned down on the 4th of July leaving behind a family, friends, and a legion of fans all over the world. There are all sorts of McNair stories, such as in 2002, when McNair ran a QB draw on a 2 point conversion to tie a game against the NY Giants, which the Titans won in OT. Everyone knew it was going to be a QB draw to McNair, yet he made the play look so simple and effortless it made everyone just look in awe. His ability to lead his team down the field in Super Bowl XXXIV would live in history, if Kevin Dyson hadn't been tackled one yard short. He played a fantastic second half in that game, and never made it back to the Super Bowl again. The 2003 season started off rough, as I missed the first quarter stranded in Oxford. When I got home the Titans took off, and it provided a preview to all of us into McNair's best season. It was when he really earned the label as the league's toughest player, even though many got tired of calling him that, he proved it every single week. He battled through a multitude of injuries, but played so well and was so critical to the Titan's excellent season, he was named co-MVP of the league with Peyton Manning. Most Pats fans I knew were worried about a playoff match-up with the Titans on a cold Saturday night, and they had every right to be. If Drew Bennett doesn't drop a ball that McNair threw to him perfectly late in the game, they very easily could have tied that game up, and possibly ended the Pats Super Bowl run. They didn't. When McNair left for Baltimore, I still found myself rooting for him. I still feel if he had played a better game against Indianapolis in the division round, Peyton Manning would not have a ring right now. He would never get closer than that night, as the Ravens struggled in the next season, and McNair spent much of that trying to heal from injuries old and new, only this time his body was winning out over his mind. When he retired, I was selfishly happy, as it meant I could put the McNair Titans jersey I owned back into the rotation again. It's going to stay in the rotation for a long time to come. McNair said to his teammates before a 2003 game against Miami, "There's alot of plays to be made out there today, don't take any of 'em home with you!" Unfortunately at the age of 36, we know he had more plays left to make in his life. A son who is getting ready to jump into college football soon. A restaurant in Nashville he had recently opened. A Hall of Fame speech. There were alot more plays left in that book, and it's sad they will never get to be used in the gameplan of life. Jeff Fisher can never say "Great play 9!" again. The McFarlane figure of him on my wall will remain, the jersey will always be in the rotation, and his toughness and ability will stay in mind forever. Rest in Peace Steve McNair, and thank you for the memories, good and bad. Sorry I didn't have you on my Heisman watch list in 1994. I guess you showed me, huh? I wonder how the people who voted for Rashaan Salaam and Ki-Jana Carter feel today.